The 20th anniversary issue of Gerry Cambridge’s great poetry magazine, The Dark Horse, has arrived on subscribers doormats in the last week or so. In his editorial, Cambridge recalls the magazine’s beginnings in 1995: 500 copies of a slim, buff-card-covered, stapled pamphlet. It began, he tells us, “as a forum for the best writing about poetry and the best poetry (by my own lights)”. He also quotes Patrick Kavanagh on poetry as something you dabble in and then find it has become your life and how true must that be of editing a poetry magazine too. Cambridge reflects on the changes over the last 20 years, particularly in the technology of poetry submission and dissemination, in the “endless drip-feed” of social media, and the degree to which technology has shifted the power structures of contemporary poetry. He is evidently uneasy about the influence of the turbo-charged prize culture we now live in which has “clotted and compromised” the world of poetry, alongside the “broadsheet, press-driven accolades and poetry politics that can foment discord among young writers”. It has always been a truism that the world of poetry is a cramped place and the level of attention it receives is vanishingly small. With the advent of a number of notable prizes, the urgency to be accorded such notice has upped the ante considerably so that success is ever more clearly marked, while failure is thrown into far greater contrast; though both ‘success’ and ‘failure’ are designations calculated nowadays too much in terms of immediacy. So in this context especially, 20 years is very a long time in poetry and The Dark Horse seems set for an impressive further run (equine jokes are hard to avoid and Cambridge himself does not try). This new issue is 190 pages long, with an interesting essay by Dana Gioia on poetry as enchantment, critical evaluations of James Lasdun and Mark Strand, new poems from Vicki Feaver and Oxford Poetry Professorship contender, A E Stallings, as well as Sweeney, Ryan, Cope, Mort, O’Donaghue, Carruth, Brackenbury and Stevenson and loads of others. 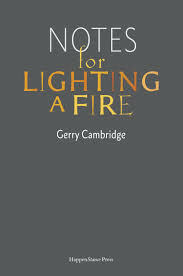 As well as an editor, of course, Cambridge is a very good poet and as my contribution to the magazine’s anniversary celebrations, I thought I’d post up my review of his last collection, Notes for Lighting a Fire (HappenStance, 2012). Wishing happy birthday to The Horse . . . 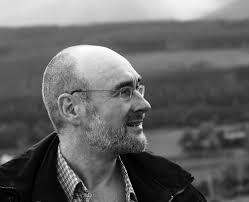 In Gerry Cambridge’s fine new collection, he seeks to peel away the inessentials of history, personal life, or the natural world in the confident belief that what remains possesses truth and value. His work attends to details, revels in tracing processes (laying a fire, peeling an orange, blowing an egg). He has a fine line in self-deprecation as in ‘Exposure’ where the narrator shaves his head, reflecting a desire to “go bare”, summed up as “an attempt at honesty, a minor / variety of courage”. Actually, this identifies a major thrust of Cambridge’s poetics, aspiring to the “plainness of nouns”, a reverence for things as they are. So conjuring a flame is an apt subject and ‘Notes for Lighting a Fire’ offers a practical guide, evokes a vast universe encompassing the act, touches on the contrasting evanescence of the merely topical, parallels the kindling of flames and poems and concludes with an expansive juxtaposition of science, history, earth and outer space as Orion swings into the sky “like a spaceship / of light from behind the black burial mound of that hill”. It is quite a performance. Writing for a local council project to light its public buildings sounds less than inspiring but the sequence ‘Light Up Lanarkshire’ quickly escapes its unpromising beginnings. Light energy is derived from coal and coal “is a terse black language” ripe for this poet’s essentialist pen. Lanarkshire’s place-names and history are evoked with “millions of years” to create the “black subterranean seams” and their mine owners’ wealth. The best part of the sequence is Cambridge’s portrait of his miner grandfather, in “necktie and suit with his strong-jawed wife”. Recognising he may not have been an easy man to live with, he still finds admiration for him, “spruce as a gentleman, stepping out for his evening shift”. Likewise, Cambridge’s elegy for his father, only partially ironises inherited values of “the dignity of work etcetera” (‘Light Leaves (1/iv)’). The son/grandson memorialises the undeveloped spark of aspiration in both men’s “stab at a perfect world” (1/x) in his father’s lovingly curated toy trains and his grandfather’s extravagant purchase of “a fancy clock for the house”, devastatingly dropped when confronted by his wife’s critical “sherricking”. In Cambridge’s other great love, the natural world, he finds further repositories of continuity. His queen wasp’s abdomen stores “Ten thousand summer wasps, wasp dynasties / Down the perpetual light of centuries” (‘The Queen’) and there is a delightful sequence of poems on a child collecting birds’ eggs. The more ecologically correct adult judges this a mere function of egotistical “possession” (‘Sacrifice’) but perhaps it more truly reflects a concern for paradoxically affirming fundamentals: the securing of the prize of a sparrowhawk egg would be “a bartered death that said I live! I live!” (‘A Sparrowhawk’s Nest’). Love of nature, stoicism and conservatism come together in ‘The Great Things’ in which details of North Ronaldsey are lovingly collected – its sense of space, inhospitable weather, a shrinking population, life clinging on, the beauty of a setting sun. The poem concludes, “Elsewhere the great things of the world will be taking place” but the irony is strong since it’s these stripped-back mundane details that form the true ground of human life and constitute the focus of this honest, profound and coherent collection. What a superb review and so glad you reviewed Gerry’s work too. That is the only problem with editing a top Journal. You cant publish yourself.